Whabagoon is an Ojibway Elder of the Lac Seul First Nation, a Keeper of Sacred Pipes, active community member, speaker, and a land defender and water protector. 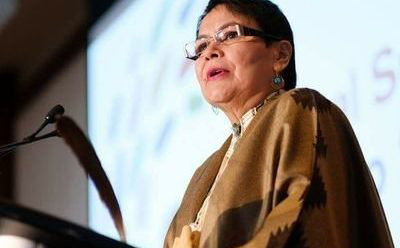 Whabagoon’s strong commitment toward educating the community has earned her the Community Service Award given by the Bank of Montreal and the Alzheimer’s Society to persons who combine business and community service. When she is not busy speaking, or teaching in the community, and working with diverse groups, ages and backgrounds; Whabagoon enjoys painting, singing, and participating in community hand drum circles and events. A closing ceremony to mark the official end of Tech Forum & ebookcraft 2019 will be performed by Whabagoon, an Ojibway Elder of the Lac Seul First Nation.